A testimony to God’s unfailing love, and how through Him your passion and desire to serve can be ignited. Jay and Beth Loecken were a typical family living the American dream, great job, nice house, cars, toys, and not lacking for any ‘thing’. Yet they were missing out on something and couldn’t quite put their finger on it. Deciding to take a mission trip to Africa with 3 of their 4 children and serve in a small community changed their way of thinking from then forward. They were missing what God had called them to and got caught up in the ‘stuff’ that the world calls us to. Giving up all the ‘stuff’ and going on the road in an RV the family set out to serve where God led them. They met families along the way that they were able to be blessed by and be a blessing. They worked side by side with churches sharing their message of not only talking about helping others, but coming along side of them and going out and getting programs started. Throughout the book Jay and Beth share their own personal testimonies, stories from their childhood, and ways God has worked in their lives. We read bits from the children and how the experience of travelling in the RV has affected them. An autobiography of their mission and how God brought it to fruition, not only in their own lives but also in a way to share it with others. I loved the open honesty of Jay and Beth, like they were talking to good friends in writing the book. They didn’t hold back from their story and make it sound all glittery and golden but gave us the hardships that came with starting a ministry such as this. They didn’t write as if they were hero’s, but more like those who they served were the real hero’s. They were very big into Random Acts of Kindness which is a universally understood concept. I loved how they could utilize that with fellow Christians as well as those who were unsaved. It was definitely a book that got me thinking, am I living for the now or am I living for eternity?? Q: In your book, Passion to Action, you discuss how a trip to Africa changed the direction of your life. Why did you decide to go on a mission trip to Africa and how did that trip affect you? Something had been stirring in our hearts for some time before we decided to go on the mission trip to Africa. We got away for a weekend to talk and pray about the direction of our lives, and we decided that going on a mission trip together would be a powerful thing to do as a family. 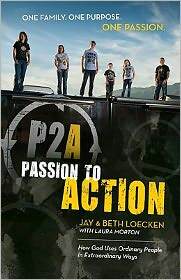 We wanted to teach our children that being a Christian involved more than just going to church; it required action. When Jay was in college, he traveled overseas extensively for two summers. Being exposed to the struggles and poverty of those outside of the U.S. made a profound impact on him, and he desired that our family experience what life was like in another culture. We knew from Jay’s experience that the trip would impact our lives, but we had no idea how much it would affect each of us. We were blown away by the poverty and conditions in Africa. It’s one thing to see images of people in distress on a television screen, but to see and smell the poverty in person was overwhelming. While the images we saw there will stay with us forever, the African people made the biggest impression on us. In the middle of dire and desperate conditions they had such resilient spirits, coupled with an amazing sense of community and joy. We came home with the realization that while we were rich in comparison to them materially, we were poor in comparison to the community and joy they possessed. Q: Upon returning from Africa, you made the decision to sell your home and travel the country in an RV. Had you ever envisioned yourself living in an RV before that time? Since we were first married, we dreamed that one day we would travel as a couple. We couldn’t imagine that would happen until after the kids were grown. As a boy Jay had traveled for weeks at a time across the U.S. with his parents and grandparents. He had many fond memories from these trips, and we imagined how amazing it would be to do this with our family. We just didn’t see how it would ever be possible, so we stuffed our dream down and never pursued it. Q: What were your biggest fears about uprooting your family and following your dream? Were your family and friends supportive of your decision? Jay’s biggest fear was what this decision would mean to our family financially. We were concerned that buying a motor home meant we were throwing our money away as RV’s depreciate quickly over time. He also wondered how difficult it would be to continue his career as a mortgage broker while traveling from city to city. We had concerns about the friendships our children would leave behind. We wondered how they would adapt and if they would be able to make friendships as we traveled. Our families at first questioned the financial wisdom of our decision, but in time they became supportive while many of our friends in Atlanta thought we were nuts. They had a hard time understanding why anyone in their right mind would want to trade a 4,500 square foot house with four bedrooms and two and a half bathrooms to live in a 340 square foot home on wheels with two rooms and one toilet. Q: How has your faith changed since you first began to follow your God-given dream? Our faith has grown tremendously since we began pursuing our dream as well as over the past three years we’ve been on the road. As we’ve stepped out and broken past our fear, we have seen God show up in amazing ways. We no longer question IF God will come through; we only wonder HOW He will come through for us. Jay quit his job as a mortgage broker almost two years ago to pursue the non-profit we started, and while we haven’t had an official income we somehow miraculously always have enough to live. This past September things were looking pretty bleak. We only had about a month’s worth of income left in the bank, and we weren’t sure what to do. We got on our knees and placed the situation in God’s hands, and then we waited to see how He would come through. A couple of weeks later we met a couple from the church we were working with who were impacted by our ministry, and they generously donated $40,000 to our non-profit. We were completely blown away by God’s faithfulness and His ability to meet all of our needs. We have also seen our faith expand as we have gone into places and worked with people that we would have never even thought of going to or working with when we lived in Atlanta. Q: In Passion to Action, you discuss how you not only sold your home and began traveling in an RV, but you also decided to live your life serving others. How do you decide where you will go and who you will help? When we first got on the road, the decision of who and where we served happened organically. We simply prayed and asked God to show us where we should go and who we should serve. While it was invigorating to see God show up and serve in a variety of settings, it was also exhausting. We would stay in a place for a week to three weeks at a time. Over time our schedule left us fatigued and worn out. When we started the non-profit, we developed a strategic plan that we believed would be more sustainable for the ministry and our family. We decided it was best for us to spend two months at a time in each city where we work in order to develop relationships. Because of this strategy we try to plan in advance and book ourselves out as far in advance as possible. In regards to who we will help, we have always subscribed to the belief that it is better to work with existing non-profits or ministries that are already serving those in need versus trying to re-create the wheel. As a result of this belief, when we work with a group or church we learn what organizations or people they are working with in their communities, and we join forces to work with them. We specifically try to work with organizations that implement community development principles and who are committed to treating those they serve with dignity and respect. We will go where we are invited, regardless of the size of the group, as long as we believe that God is working. We try to be obedient to His leading and simply join Him in the work He is already doing. Q: You have now formed an organization based on your experience. What is your mission for Passion to Action and how do you hope it will impact the lives of others? Our mission for Passion to Action is to inspire, empower, and mobilize people to put their faith in action. We believe that inspiration is the fuel for change. In order to step out it’s critical that we first be inspired to act on our dream and passion. Our desire is that our story would serve as a catalyst to inspire people to action. We are all called to serve and that looks different for each of us. While we believe it’s important THAT we serve, we also believe that it’s significant HOW we serve. We hope to equip people by teaching them community development principles which empower them to serve others with dignity through developing relationships, avoiding the trap of dependency, and making a long term commitment to serve their communities. Lastly, we hope to mobilize people into action to serve others. Our desire is that when people step out of their comfort zones and break past fear, that this will create a heart change in them and help to catapult them into a lifetime of service.